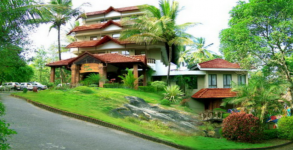 The northern district of Wayanad can be aptly called the abode of Kerala’s tribal population. The district, which forms an edge of the Deccan plateau of South India has a luxuriant forest cover and receives the maximum amount of annual rainfall compared to other regions of the State. Waterfall, mist covered valleys, spice plantations, hill ranges, wildlife sanctuaries, stone age sites are some of the popular attractions of Wayanad. Pakshipathalam (7.5 km from Thirunelly): This place can be accessed only by trekking. Rare species of birds can be sighted from the watchtower of this bird sanctuary. Kuruvadweep (15 km east of Mananthavady /58 km northwest of Sulthan Bathery): This 950-acre, uninhabited island on the eastward bound Kabani River is an ideal picnic spot.The wooded stretch of land is home to rare species of birds, orchids and herbs. 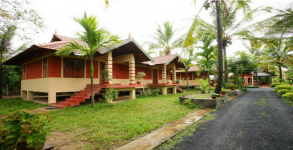 Tholpetty Wildlife Sanctuary (20 km east of Mananthavady): This sanctuary has a wide variety of animals. Nagarhole Wildlife Sanctuary (40 km from Mananthavady): This sanctuary in Karnataka state extends over an area of 643.39 sq. km. The park houses diverse species of plant and animal life. Chembra peak (18 km west of Kalpetta): At 2100 m above mean sea level, Chembra is the highest peak in Wayanad and is an ideal area for trekking. Banasura Project, Padinjarathara (25 km northeast of Kalpetta): A mini hydel project with the largest earth dam in India and the second largest in Asia is built here. A sprawling sanctuary and park with ever flowering trees are major tourist attractions. Meenmutty Waterfalls (29 km from Kalpetta): An interesting 2 km jungle trek of the main Ootty road, Meenmutty is the largest most spectacular water fall in Wayanad. A unique feature is that water drops about 300 m over three stages. Kanthanpara Waterfalls (22 km away from Kalpetta): Smaller than sentinel rock, Kanthanpara and it's surroundings make for an ideal picnic spot. Sentinel Rock Waterfalls (23 km away from Kalpetta): Locally known as soochipara, the pool at the foot of the falls is ideal for a quick dip. The more restrained can have equally good fun just taking in the scenery. Wayanad Wildlife Sanctuary (17 km from Sulthan Bathery): Established in 1973, the Sanctuary is contiguous to the protected area network of Nagarhole and Bandipur of Karnataka on the northeast and Mudumalai of Tamil Nadu on the southeast. Rich in bio-diversity, the sanctuary is an integral part of the Nilgiri Biosphere Reserve. The management lays emphasis on scientific conservation with due consideration for the general lifestyle of the tribals and others who live in and around the forest region. Lakkidi (55 km east of Kozhikode/ 5 km south of Vythiri): Lakkidi, the gateway to Wayanad, is situated 700 m above mean sea level, at the crest of the Thamarasseri Ghat pass. 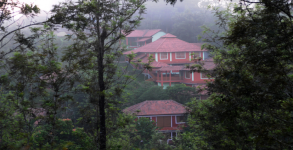 Lofty peaks, gurgling streams and luxuriant forests add magic to the journey up the winding roads to this hill station. Pookot Lake (15 km away from Kalpetta): This perennial fresh water lake, nestled among wooded hills, is the only one of its kind in Kerala. Boating facilities, a children's park, a handicrafts and spices emporium and a fresh water aquarium are among the tourist facilities available here.